Can you hand me a towel, please. How many times have you asked that question? You know, your hands are wet and the towel is not on the hook where it normally resides. Often the answer absently wings its way back to you: Which one? Let it be beige, blue, pink or yellow but never bring a white one with the yellow stripe. A pair of white towels with a deep egg yolk yellow stripe loving lives in the airing cupboard and are only for looking at. They are delicate and have a long story. History. Now, to you they might look like old rags. No. They are ‘Anti –queues’ and not faded! The next generation in this case is my Elly. I have used them many years ago. 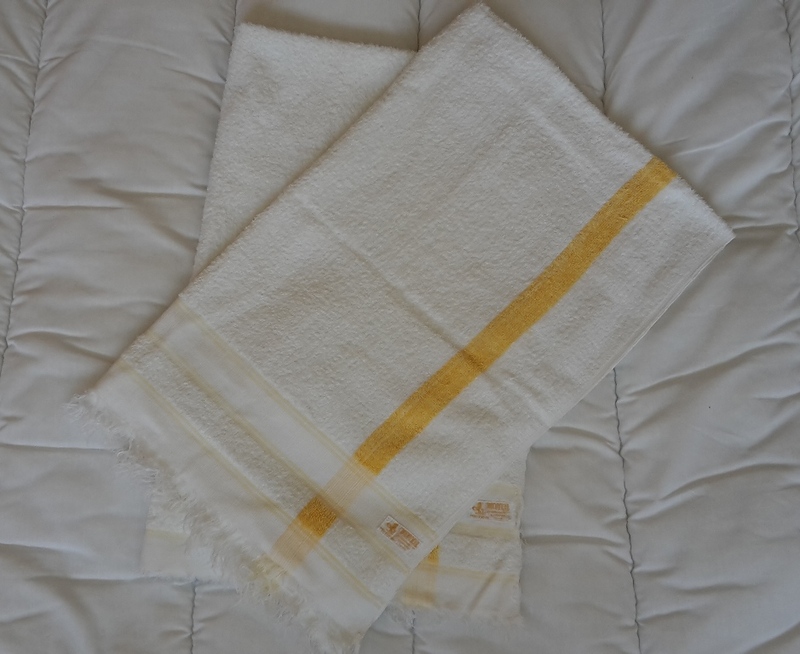 Jack bought the towels in India, when he was serving there in World War 2 and posted them home to his mother. It was before being moved on to Burma and the injury that ended his war. Right, it is your turn now. What everyday object or item in your house has a long history or story behind it? This entry was posted in Family, memories and tagged Cawnpore India, Memories, Towels on June 3, 2016 by Grannymar. I have some ornaments that would look totally out of place in todays’ society…one is a china rabbit, the other is a strange kind of roughened china of a seem to recall a poodle holding a handbag – (there are more, but these spring to mind) – they aren’t big. He supposed to go to England with Mother and me, but there wasn’t room in the suitcase so he stayed at home with Dad. Interesting memories, Cathy. I am glad I gave you the opportunity to recall them. a wedding-ring quilt in pale yellow with the rings made from pastel summer dresses of my grandmother, ggm and gggm, all put together by grandma for the wedding of my mom and dad. Grandma Serelda was a pioneer woman, who learned to sew from patterns brought from paris. she made all the wedding dresses in the town. A second favorite is an elite brotherhood Bible my great grandfather brought along when he left in the great hunger and carried in the american civil war. Great stories, Lin, I love those old quilts, and such memories they contain. So, another connection to India! It is no longer Cawnpore. It is now Kanpur and to the best of my knowledge, these towels are no longer made there. Similar ones come from the deep South of Tamil Nadu and Kerala. I use similar ones from there. Kanpur is now more of a leather products city. It was one of my favourite places to visit during my days of marketing. Thanks Ramana, I thought you might be able to add some information about the towels. I have two red morrocco bound books with gold stamped spines. The Jungle Book and the Second Jungle Book. They were published in 1913 especially for the Indian market, in very lightweight paper. My parents bought them second hand in Nigeria for my brother. They were originally owned by a gentleman with a Portuguese name who lived in Lahore. Then my parents autographed them, and now they are mine. I can’t check the details, as they’re at home and I’m in hospital in Brisbane, but they are treasured. Treasure with history! The very best kind, Kate. I loved this story, Marie. It’s wonderful to hear how these towels have been cared for over so many years. They really do tell a story! I have many little personal “treasures” that have significance to me, but nothing quite as “ordinary turned extraordinary” as these beautiful towels. I’m sure one day Elly will indeed treasure them, too! Debra, The towels are over seventy years old, Jack was back in hospital in England in 1944/45, heavily drugged and wrapped in Plaster from armpits to ankle, with no recollection of the end of war or any celebrations. That makes them even more precious! Debra, do you think I am an inverted sentimentalist? This will seem strange I am sure, but it is what it is… Mine is an old branding iron with the Cowman’s family brand. It sets on the mantle. There are none left save that one. It has so many memories of the home ranch attached to it. Brig, the branding iron was one of the tools of trade in your life at the ranch. An item touched by so many hands over the years as they worked with the horses. If it could only speak… what wonderful stories you would hear. A real treasure worth far more than a modern vase on the mantle. Enjoy. Most of our household items have a long story behind them, since many of them were bought soon after we set up home together 35 years ago. Jenny can remember exactly where and when we acquired most of them, quite often when we were on holiday somewhere. It’s fun to recall all the friends and relatives who have sat around the kitchen table with us. A kitchen table is special in my eyes and the heart of a home! May you and Jenny enjoy sharing food and time with friends for many a long year ahead. An amusing coincidence that the brand name for your towels is Muir! Yes, I did think that, Nick when I was taking the photo. Any connection? On another topic, I was in Brown’s for a coffee the other day and you know me… I talk to everyone. I had a nice chat with a gentleman who I see behind the counter occasionally. I suddenly realised that if I closed my eyes I could be talking to you. He voice was exactly like yours! Lovely story. You had a way of weaving it that had me right there. Mine is a teacloth embroidered by my mother. It has now gone on stage too as part of the props in a play. Mum was on stage herself so very apropos. Every time I look at it I smile. Irish linen, beautiful embroidery of lilacs.